Samosas are fried snacks and will be served all over India. 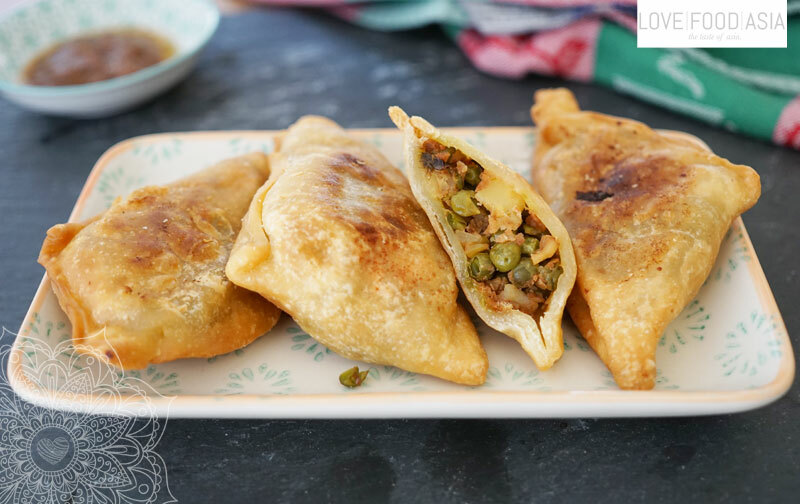 This is our recipe for traditional North Indian Samosas. Or as you would say in India: Punjabi Samosa. In Punjabi cuisine the Samasa filling isn´t mashed like you will find it in other regions of India. You will need some time and practice before you can make the dough perfectly. But after some practicing you will soon have your own perfect dough. Mix flour, salt, ghee and lime juice using your hands. Pour in ¾ of water and mix with your wet hands. Add more water until you have a smooth dough. Now knew for 10 minutes. Form a ball. Cover with a wet kitchen towel and set aside for 30 minutes before you start to make your Samosas. Now roast all spices in a pan for 1-2 minutes and transfer them to a mortar. Prestle until you have a fine powder. In the same pan stir fry fresh chili in peanut oil for 1 Minute. Add peas and cooked potato dice. Stir fry for 5 minutes and add spices. Taste with salt. Set aside to cool. Now back to the dough: Knew it lightly and divide into 6 portions. Use a rolling pin to make a flat piece of dough. Use a knive to cut it into two halves. Use your wet hands to wet the dough alongside the cut. Now fold the dough like you would make an ice cream waffle. Press the wet ends of the dough together to get the ice cream waffle form. Use a spoon to transfer the filling into the dough. Press the open ends together until you have the typical samosa shape. Heat oil in a wok and deep fry samosas until they become golden brown. Serve with our Tamarind Chutney or one of our spicy dipping sauces.